Some of the folks pictured here – don’t’ know the difference between a Mega-Hertz or a Mega-Pixel. Fortunately for you, the ECT folks do. 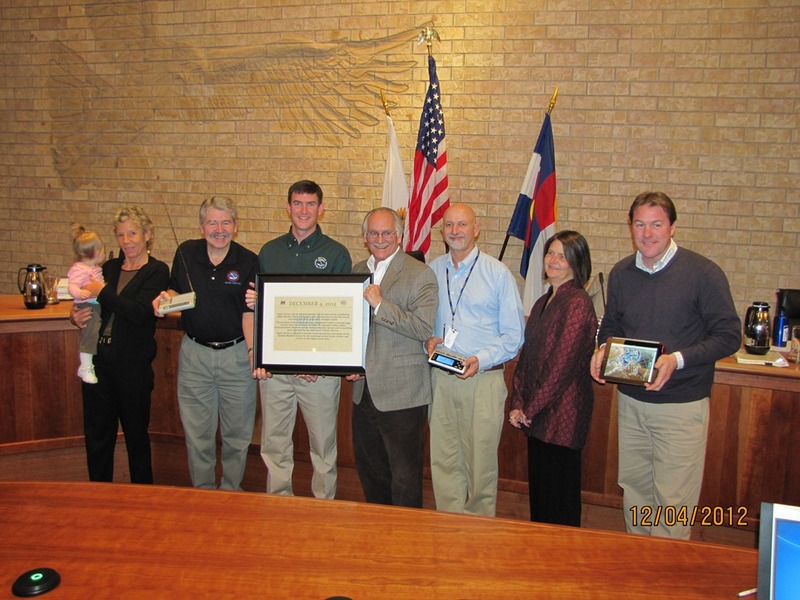 And so does Eagle County’s Emergency Management Director – Barry Smith (pictured 3rd from right). The special NOAA/NWS Weather Radio that Barry is holding (and cool weather Radios like that) can be purchased from our friends at the Vail Ace Hardware. ECT thinks that Radio is almost as cool has having your own new ECT 2013 Calendar that works 365 days a year, with no batteries and regardless of what the weather might be! If you already have a Weather Radio – tune into 162.450Mhz – our Eagle County, Colorado Weather Radio transmits from Castle Peak (north of Eagle) at 300 Watts – 7x24x365 thanks to the year(s) long efforts primarily of Barry Smith. Good Work Barry. « Holiday Shopping? Support the ECT – Order our 2013 ECT Calendar! And it’s 100% Made in the USA. A local guy Joel Gratz runs it. He went to Penn State. His compadres are all Americans. The servers are here in America, run by Americans. Please support http://opensnow.com. When you do, you’re supporting American businesses. Thanks in advance for doing so.